Oil painting on wood panel. 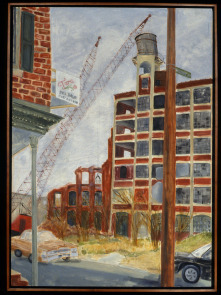 Artist's caption: "The corner of American and Wildey Streets with a view of the Burk Brothers Tannery water tower that was visible from anywhere in the neighborhood." View of sign for Tara Real Estate company in foreground.